WASHINGTON, D.C. -- Americans' confidence in the nation's major institutions has edged up in 2017, after registering historical lows over the past three years. Newspapers, public schools and organized labor, in particular, have improved in public esteem. The average percentage of Americans expressing "a great deal" or "quite a lot" of confidence in 14 institutions is at 35%, up from 31% in 2014 and 32% in 2015 and 2016. 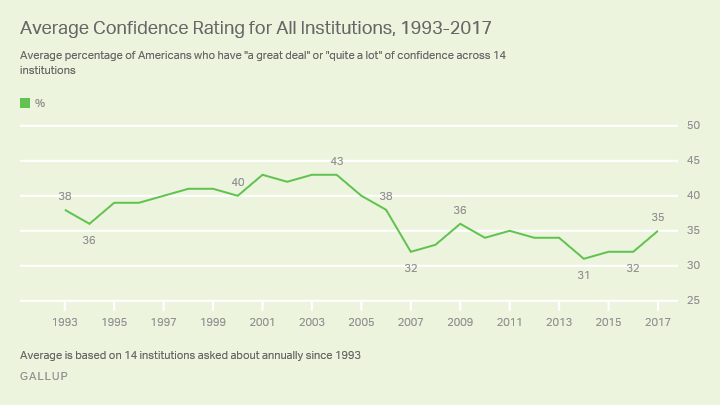 With this year's uptick, Americans' confidence in key U.S. institutions is close to the historical average for the 14 institutions Gallup has asked about since 1993 (37%). Confidence in institutions was generally higher prior to 2007 than in the years since, and current levels are also well below the high point of the 43% confidence registered in 2001, 2003 and 2004. This year's June 7-11 update shows that confidence is nominally higher in 10 of the 14 specific institutions included in the long-term average, although just three of the changes are statistically significant: the rise in confidence in newspapers (up seven percentage points), public schools (six points) and organized labor (five points). In addition to the 14 institutions in Gallup's long-term trend, this year's measure included small business, added to the list in 2007, and confidence in internet news, asked about only two times previously. Overall, U.S. adults say they have the most confidence in the military, as has typically been the case since the mid-1980s. Americans have almost as much confidence in small business as they do in the military. Confidence levels drop off substantially after these two, with only one other institution -- the police -- getting a combined "great deal" or "quite a lot" of confidence rating over 50%. At the other end of the spectrum, two institutions have confidence ratings below 20% -- Congress, last on the list with a confidence rating of 12%, and news on the internet, at 16%. Forthcoming Gallup.com stories will discuss the trends in confidence on several of these institutions in more detail. 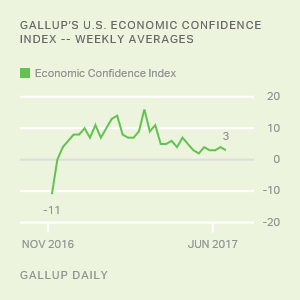 The overall uptick in confidence this year is primarily the result of increased confidence among Republicans, paralleling the increased GOP optimism noted in economic confidence and satisfaction with the way things are going in the nation. Republican and Republican-leaning independents' average confidence in the 14 major institutions edged up to 37% from 30% last year. Democrats and Democratic-leaning independents, confronted with a Republican president and Republican-controlled Congress, have roughly the same confidence in the 14 institutions as last year -- 33% compared with 34%. Republicans and Democrats essentially flipped their confidence ratings of the presidency this year. Republicans' confidence surged 46 points compared with 2016, while Democrats' confidence fell by 49 points. Last year, with a Democrat in the White House, Democrats were much more confident in the presidency than were Republicans. This year, Republicans' confidence in the presidency is 50 points higher than that of Democrats. A similar pattern is seen for the U.S. Supreme Court. Republicans' confidence in the Supreme Court jumped 11 points this year, after Donald Trump's appointment of Neil Gorsuch to replace the late Antonin Scalia, while Democrats' confidence stayed exactly the same. Perhaps in reaction to Trump's vociferous criticism of the media, Democrats this year express significantly higher levels of confidence in newspapers than they did last year, while Republicans' confidence stayed roughly the same -- and much lower than Democrats. Several important findings emerge from Gallup's annual update of Americans' confidence in the nation's major institutions this year. First, the uptick in Republicans' average confidence resulting from the election of President Trump was not offset by a decrease in confidence among Democrats, leaving the population, as a whole, more confident than in previous years. Second, despite this increased confidence, Americans are still skeptical of most of the major institutions that make up U.S. society. Major institutions have an average 35% "great deal/quite a lot" confidence rating overall, and only three institutions garner a confidence rating above 50%. Major institutions such as big business, the criminal justice system and banks get high confidence ratings from less than one-third of the public. Finally, the dismal level of public confidence in Congress -- with 12% of Americans saying they have a great deal or quite a lot of confidence in the nation's legislative body and 44% saying they have very little confidence -- highlights what Americans themselves say is the nation's most important problem: a dysfunctional government that has lost much of its legitimacy in the eyes of the people it serves. Seven in 10 Americans have "a great deal" or "a fair amount" of confidence in the U.S. government to protect its citizens from future acts of terrorism. Most U.S. investors have not noticed any effects of higher interest rates on their finances, and two-thirds say higher rates will not affect their investment decisions.